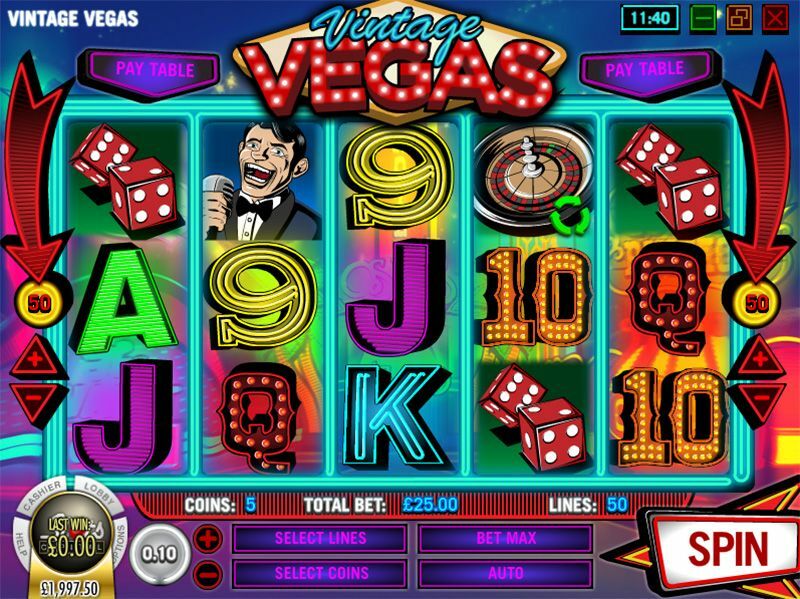 Vintage Vegas video slot is a very unique one from the design studios of Rival Powered. Launched in 2014 and themed around the glitz and glamour of 1970s Las Vegas, this slot game is available on instant play or download to your device. The most outstanding feature of this progressive slot game is its massive $37,500 jackpot. You’ve got a pretty good chance of hitting the jackpot if you play this game long enough since it gives you many options for placing wagers. The symbols include a beautiful Las Vegas showgirl, casino chips, dice, playing cards, a cowboy, and also a slot machine. The game is extremely attractive thanks to its superb graphics and bright colours. It is also available for mobile gaming, albeit with a different layout in order to make the game fit into the smaller screen of your cell phone or tablet and also to ensure that the different features and buttons are easy to access. You can play this game for money or for free. Vintage Vegas has 5 reels and 50 pay lines on which you can place wagers for a wide range of bet sizes from $0.01 to $0.25. You can bet up to 10 coins at a time which makes the maximum wager here $125. The game’s Bet Max feature lets you wager the maximum level of pay lines and coins without having to adjust your wager time and again. The many wagering options allow you to place bets that suit your wagering style and budget. Wins occur on active pay lines when matching images appear on it from the left to right. Like all the latest video slot games, Vintage Vegas has a few bonus features that will help you get closer to a win. They include Scatter and Wilds symbols. Unfortunately, there isn’t a bonus game as part of this video slot. Interestingly, games from Rival Powered tend to have plenty of bonus features. Even so, the designers have compensated for this lack by increasing the size of the standard payouts. The game uses Scatter symbols to launch a free spins feature. The scatter symbol in this game is, appropriately enough, a roulette image. The free spins get launched whenever at least 3 scatters appear on the screen. 3 scatters give you 10 free spins. 4 and 5 scatters give you 20 and 60 free spins respectively. If you are really lucky then scatters will appear during the free spins. This starts the game all over again and the newly granted free spins will be added to your original tally. The game also has a Wilds symbol, the cowboy, that can take the place of any other symbol (except for the scatter) in the game in order to complete winning combinations. The wild symbol also gives you a 5x multiplier during the base game in case it features within any winning combination. If the same symbol appears during the free spin then you get a 11x multiplier. Incidentally, the wilds occur fairly frequently during the free spins. Unfortunately, there is no multiplier benefit to getting five wilds for a jackpot which means that the size of the jackpot will not increase. We are quite happy to recommend this game because it’s great fun to lay and we feel that it gives plenty of opportunities to win money. It does have a couple of drawbacks, mostly to do with the lack of 3D animation, but they’re not things you would wish to fret over. So go ahead and check this game out; you’ll enjoy yourself tremendously.